Papaya leaf extract can be used as an insecticide against various organisms and their larvae such as mosquitoes, aphids, caterpillars and worms. The toxic compounds in papaya leaf extract that are insecticidal are alkaloids, papain and cyanogenic glycosides. A multipurpose insecticide can be extracted from papaya leaves by mashing and soaking them overnight in water. This mixture is strained and diluted with the addition of soap and a solvent. This aqueous (and biodegradable) solution is then sprayed on crops, plants and produce. 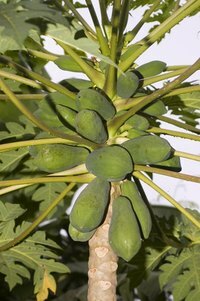 In addition to having insecticidal properties, other papaya leaf compounds such as flavonols and tannins demonstrate antimicrobial properties. Papaya leaf insecticide contains papain, a proteolytic enzyme that cleaves proteins into smaller compounds such as amino acids. Papain, when sprayed on a plant, is a deterrent against caterpillar infestation and their consumption of leaves. However, scientists don't yet understand the precise mechanism by which papain works. Research conducted in Japan by organizations such as the National Institute of Agrobiological Sciences suggests that papain is toxic to many herbivorous insects. Papaya leaf insecticide contains alkaloids such as carpaine. This is an "anthelmintic alkaloid" and has known uses as a folk remedy for expelling gut worms and other parasites. Alkaloids such as carpaine work by constricting blood vessels and depressing autonomic nervous system activity. This compound contributes to the insecticide's effectiveness in controlling the larvae of the anopheles mosquito, which carries malaria. Users spray the insecticide in pools of stagnant water where the mosquito lays its eggs. The alkaloid kills the larvae, disrupting the life cycle of the mosquito and preventing malarial spread. Cyanogenic glycosides are naturally occurring compounds in papaya leaves that break down into cyanide. Cyanide itself is toxic to living organisms because it inhibits oxygen from being used in biological processes. Researchers at the U.S. Department of Agriculture and the Department of Entomology at Iowa State University conducted tests on insects and discovered that thiocyanate compounds (found in papaya leaves) interferes with insect respiration.